Are you fortunate enough to own one of those great cars of yesteryear? Or do you own a custom car? Do you love showing off that classic ride? And if you don't own one of these cars, do you enjoy looking at them up close and personal as you chat with the owner? If so, then this is the weekend to be in the Lake Geneva area. This Sunday is the 11th Annual "The Cars Time Forgot Car Show", sponsored by the Delavan-Delavan Lake Area Chamber of Commerce. Free Gimmick Road Rally 11 AM to 3 PM – Leave Lake Lawn Resort in Delavan between 11 AM and 3 PM with a clue sheet that takes you through the area. There are random check-points where you’ll have to complete fun challenges. The car with the best start to finish time wins a prize awarded at the Lakeside Summer BBQ Buffet. If you have one of these classic cars, or if you are someone who wishes they did, we think you will agree with us, that this coming weekend is the weekend to be in the Lake Geneva area. Why not turn this weekend into a romantic couple's getaway for you and your special someone by giving us a call at 262-275-3322 to reserve your suite today. After a long day of talking shop and viewing cars,and meeting new folks, you can retire to the privacy of your suite at Lazy Cloud Lodge, where you can both relax in the bubble filled whirlpool tub, as you sip champagne and nibble on chocolate covered strawberries. Lazy Cloud offers premier Lake Geneva lodging for couples looking for a romantic getaway. 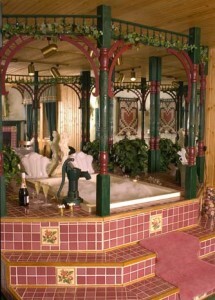 We are one of the few Lake Geneva hotels with jacuzzi in room for two. Our Lake Geneva bed and breakfast also provides wonderful amenities with whirlpools for two that have a view of the fireplace in every suite and room. Because we offer this, we are a great place for honeymoon getaways. We are located in southeastern Wisconsin – only 90 minutes from Chicago and an hour from Milwaukee & Madison. If you are a car buff, or if your special someone is, this car show would be a great way to spend a summer weekend. If you agree, then give us a call today, at 262-275-3322. More in this category: « A Winter Wedding, What a Memorable Idea!